Any closed polygon with four sides, four angles and four vertices are called Quadrilateral. It could be regular or irregular. 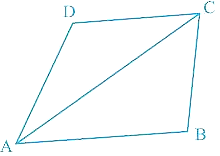 If we draw a diagonal in the quadrilateral, it divides it into two triangles. And we know the angle sum property of a triangle i.e. the sum of all the three angles of a triangle is 180°. The sum of angles of ∆ADC = 180°. The sum of angles of ∆ABC = 180°. Hence, the sum of the four angles of a quadrilateral is 360°. Find ∠A and ∠D, if BC∥ AD and ∠B = 52° and ∠C = 60° in the quadrilateral ABCD. Given BC ∥ AD, so ∠A and ∠B are consecutive interior angles. So ∠A + ∠B = 180° (Sum of consecutive interior angles is 180°). ∠A + ∠B + ∠C + ∠D = 360° (Sum of the four angles of a quadrilateral is 360°). ∴ ∠A = 128° and ∠D = 120 °. One pair of opposite sides is parallel. a. Both the pair of opposite sides is parallel. b. Opposite sides are equal. c. All the four angles are 90°. a. All four sides are equal. b. Opposite sides are parallel. 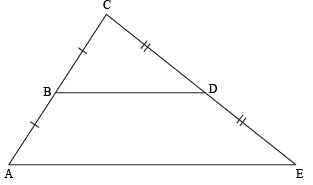 c. Opposite angles are equal. d. Diagonals intersect each other at the centre and at 90°. Two pairs of adjacent sides are equal. 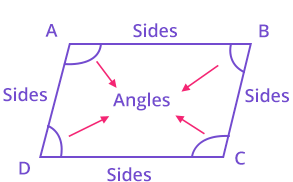 Remark: A square, Rectangle and Rhombus are also a parallelogram. Theorem 1: When we divide a parallelogram into two parts diagonally then it divides it into two congruent triangles. 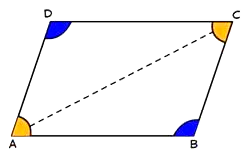 Theorem 2: In a parallelogram, opposite sides will always be equal. Theorem 3: A quadrilateral will be a parallelogram if each pair of its opposite sides will be equal. Then ABCD is a parallelogram. 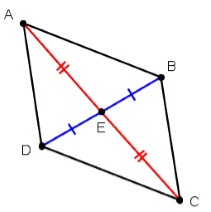 Theorem 4: In a parallelogram, opposite angles are equal. Theorem 5: In a quadrilateral, if each pair of opposite angles is equal, then it is said to be a parallelogram. This is the reverse of Theorem 4. Theorem 6: The diagonals of a parallelogram bisect each other. 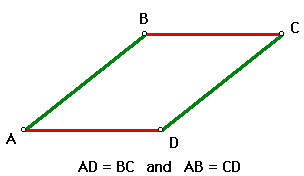 Here, AC and BD are the diagonals of the parallelogram ABCD. So the bisect each other at the centre. Theorem 7: When the diagonals of the given quadrilateral bisect each other, then it is a parallelogram. This is the reverse of the theorem 6. 1. If a line segment joins the midpoints of the two sides of the triangle then it will be parallel to the third side of the triangle. If AB = BC and CD = DE then BD ∥ AE. 2. If a line starts from the midpoint of one line and that line is parallel to the third line then it will intersect the midpoint of the third line. If D is the midpoint of AB and DE∥ BC then E is the midpoint of AC. 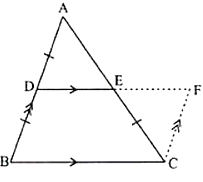 Prove that C is the midpoint of BF if ABFE is a trapezium and AB ∥ EF.D is the midpoint of AE and EF∥ DC. Let BE cut DC at a point G.
Now in ∆AEB, D is the midpoint of AE and DG ∥ AB. 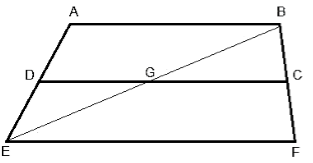 By midpoint theorem, G is the midpoint of EB. Again in ∆BEF, G is the midpoint of BE and GC∥ EF. So, by midpoint theorem C is the midpoint of BF.